$195 for the pair. 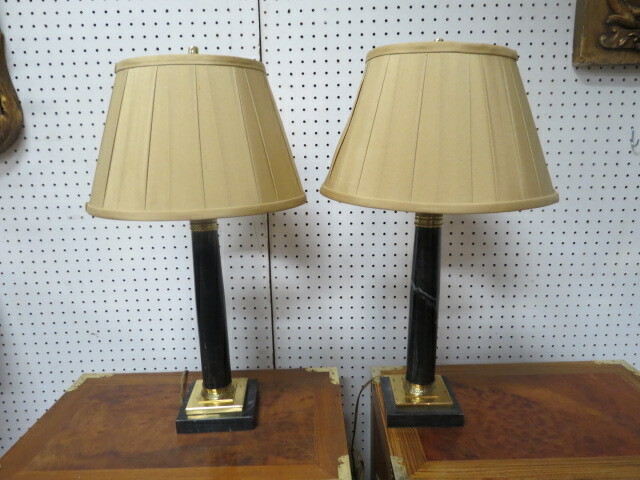 Vintage pair of black marble and brass lamps. Nice pair of column marble lamps with brass tops and bottoms, sitting on a square brass plate, which sits on a square black marble base. Pleated beige shades (one shade is misshaped). Perfect for your living room, dining room or bedroom. Very good condition. Base measures 5 inches square, shade measures 14 inches round. 24in tall.